The MonTech MDR 3000 is a high-end instrument for QC and static R&D testing for a broad range of materials (from LSR, all kinds of elastomers to composite materials). These rotorless curemeters are equipped with a closed, sealed, bi-conical die system according to all relevant ISO, ASTM and DIN standards. During the test the lower die performs a sinusoidal oscillation with a fixed oscillation amplitude and frequency, at either a fixed (isothermal) or variable temperature (non-isothermal). 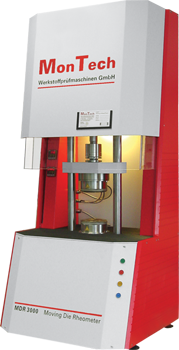 MonTech Moving Die Rheometer systems are the backbone for reliable and repeatable quality control in the rubber industry – offering a unique design with an extremely rigid test frame and superior temperature control. Depending on the instrument model, the instrument is either equipped with a mechanical or with a direct drive system. Every machine is supplied with the flexible and easy to operate MonControl Software for managing test specifications, acquiring data, and reporting results. Furthermore, every instrument can be configured to exactly meet the customer’s specific needs – this includes a modular platform of automation solutions, cooling options and sample preparation systems.